These Display Boxes are creative and attractive packaging boxes with window display and are extensively used for bedroom linens, saris, gifts, novelty etc. Once side of the box has a window or a see-through layer, which makes the packed product visible. Each one of our display boxes presented in unique designs , prints etc. These Stylish Wooden Crates make a great storage accessory for any room in your home or office & garden. 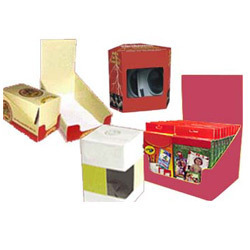 We bring forth our vast industrial experience and expertise in this business, involved in providing Display Box. Our reputation in this industry has largely been counted by the shooting popularity of our offered Tabletop Display box. We manufacture a wide range of pop boxes for material display uses. These boxes used to display items like cosmetics, toys, books, FMCGs etc. These can be manufactured using multiple corrugation & cardboard and have multicolored printing & attractive designing. These are best suitable for retail promotion & selling of products.